The Atlantic Sturgeon: It's Endangered, Now What? Most people have at least some understanding of the Endangered Species Act but what really happens after an animal is declared endangered? On January 31st of 2012, the National Marine Fisheries Service (NMFS) -- a division of the National Oceanic and Atmospheric Administration -- declared the Atlantic sturgeon endangered. A year later, the effects of that listing remain uncertain. The NMFS is still refining the listing, but fishermen and sturgeon researchers already doubt its value. "I think we're in uncharted waters here. Nobody really knows what the heck is going on," says commercial fisherman Kevin Wark. Based out of Barnegat Light, New Jersey, Wark is a lifelong fisherman. Before the harvest moratorium ended Atlantic sturgeon fishing in 1996, he fished for them commercially. Now he helps scientists study the fish in the wild. Sturgeon date back to the Mesozoic Era -- 65-230 million years ago -- making them one of the oldest existing families of fishes. Present-day Atlantic sturgeon can live 60 years, grow up to 14 feet, and weigh around 800 pounds. These unique features inspire people to compare sturgeons to mythical sea monsters. They also make restoration of the species particularly challenging. 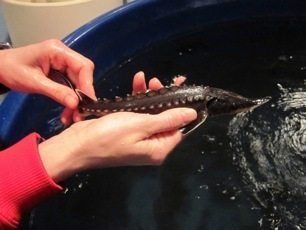 The NMFS estimates there are 9,500 Atlantic sturgeon in the Hudson River -- 4,900 of which are likely from hatcheries. According to David Secor, a University of Maryland Center for Environmental Science (UMCES) biology professor, these population estimates are derived from the recapture of tagged sturgeon. NMFS's estimate uses Hudson River data from 1995. Wark argues that NMFS's estimate is too old to recognize that Atlantic sturgeon numbers may be increasing. For the last five years, he has been working on a new estimate and says he's seen more sturgeon than he ever before. "Basically, the assessment they're using is horrible. Everybody knows that," says Wark. However, a current population estimate is not required to declare a species endangered. "The standard under the Endangered Species Act is best available information and because there were no new estimates, those were the estimates that we had to use," says Kim Damon-Randall, an NMFS endangered species coordinator. The designation, she says, is instead reliant upon the severity of threats to the species. In this case, threats include climate change and bycatch (when an animal is caught accidentally in gear that is meant for a different target). Four populations of Atlantic sturgeon are now endangered. Their range spans from New York to Florida, meaning everyone within that area must avoid these fish. Any actions that disrupt the fish in any significant way can carry fines of $500 to $13,000. Commercial fishermen will be given incidental take permits which allow a certain amount of interactions with the sturgeon. The number of interaction will depend on how many are deemed unavoidable. For now, fishermen are sans permits because they are created post-listing. This leaves them potentially vulnerable to excessive fines but Wark hasn't heard of any enforcement. Research permits were available almost immediately but restricted some on-going studies. This hindrance to research concerns Secor. "I'm in favor of it. I'm not enthusiastically in favor of it," he says of the listing. The Aquaculture Restoration and Ecology Program at UMCES previously paid local fishermen for their Atlantic sturgeon bycatch. They hoped to restore the local population with hatchery-raised native fish. Most of the fish brought in were juveniles -- under three years old -- which meant they couldn't breed for another 10-15 years. The lab opened in 2003 and has yet to have a reproductive fish amongst its approximately 800 residents. They bring in larvae from Canada and will keep their 20-30 local specimens but the bycatch reward program is over. Wark says that a threatened listing would have been a less destructive choice. "We're not against regulation at all but we want everyone to know that the infrastructure [of the fisheries] will collapse and it will never come back," he says. A lower status would allow different areas to tailor the law to their needs (as opposed to the "endangered" status, which provides full protection, regardless of location). Modified fishing gear and techniques have also been recommended. Secor says that making nets sit closer to the seafloor or leaving them in for less time may reduce fatalities. He also says fishing restrictions in sturgeon-heavy areas might help. Wark also supports modified nets - he has been developing some himself -- but notes that any gear or technique changes will cost fishermen, in some cases enough to shut them down. Experts seem to agree the sturgeon deserve extra attention. The problem is that no one has found a solution that satisfies everyone. After nearly a year, NMFS is still working on the incidental take permits, designation of critical habitat, and a recovery plan for the sturgeon. In the meantime, Wark says fishermen are already signing a petition to reverse the endangered status.